This is one of MY FAVORITE WESTERNS … a Classic. Nice write up Rick !! Jeremiah Johnson is one of my all-time favorite movies. I have watched it so many times that I know what the characters are going to say before they say it. The movie is great on many levels. It has a great story, great scenery and great music. It is the music part that inspired this post. I have wanted to soundtrack for a long time, but everything I have found is lacking. The music is there but not the words. 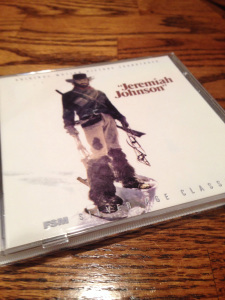 To me, the narration of Jeremiah Johnson is one of the vital aspects of the movie. The music without the words is missing something. A couple of weeks ago, I found a copy of the original soundtrack on the Internet and ordered it immediately. Honestly, I paid too much, but sometimes sacrifices have to be made. A few days ago, the CD arrived.